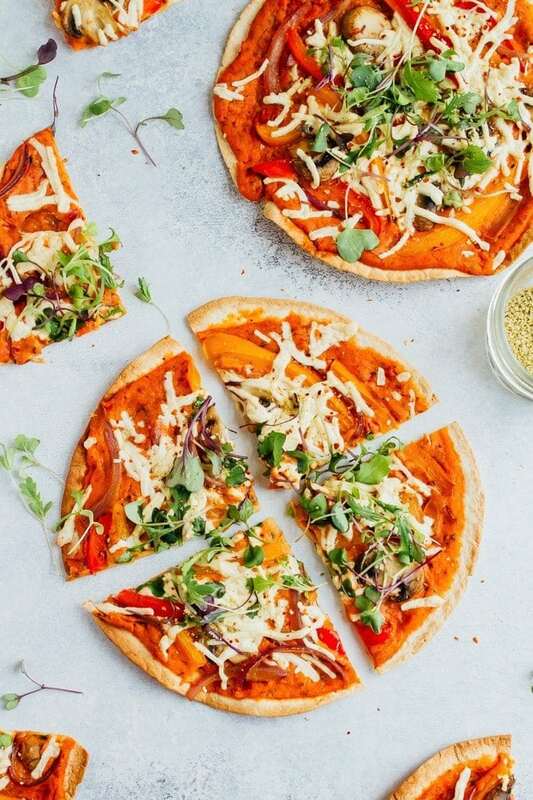 Get creative on pizza night with these thin and crispy vegan tortilla pizzas. 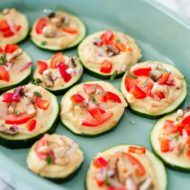 They’re personal-size (for instant portion control), loaded with veggies and have an extra protein boost from the hummus! Have leftover tortillas and veggies from #tacotuesday? Turn Thursday into pizza night and make mini, personal-size tortilla pizzas! Just grab a container of hummus, tomato sauce, veggies and some (vegan) cheese and you’ll be ready to go. Whenever we make pizza at home I always request “make-your-own pizza” night. This way Isaac and I can both choose our own toppings and make personal-size pies. Tortillas, pita and naan work great for this and it’s awesome because you don’t have to fuss with making a homemade crust. Or argue over the topping situation. Everyone gets their favorite toppings and a whole pizza to themselves. We always seem to have extra tortillas around so that’s what I’m using for this recipe. 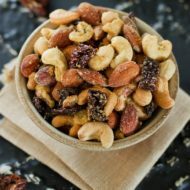 Plus, I’m a huge fan of crispy, thin crust pizza and using tortillas for the crust ensures each bite has a little crunch factor to it! With National Hummus Day quickly approaching (it’s this Saturday!) I decided to start the celebration early by using hummus as part of the pizza sauce. 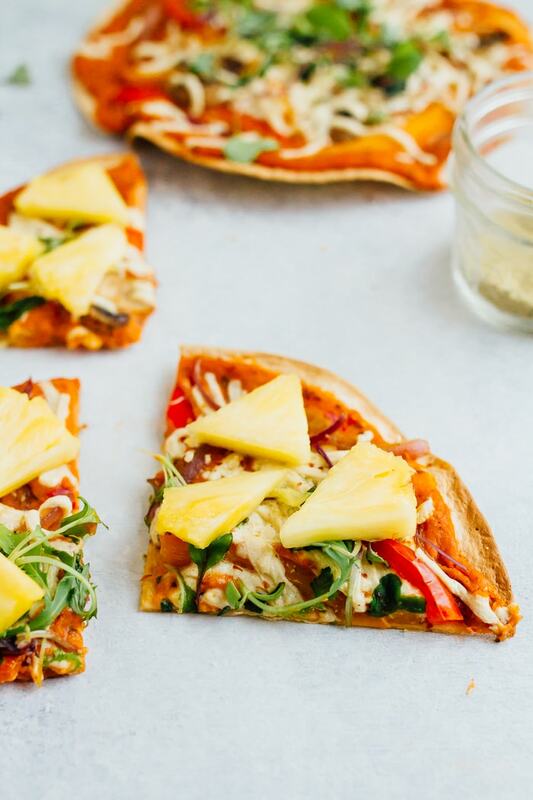 It’s perfect for adding flavor and plant-based protein to these vegan tortilla pizzas. For this recipe I used Sabra’s Roasted Red Pepper Hummus, but I’ve also used garlic and it’s delicious too! Just pick your favorite hummus flavor and roll with it. That’s the best part about this recipe — it’s really flexible. Feel free to play around with the toppings based on what you have in your fridge or your fav pizza topping combos. For the toppings we loaded our tortillas down with sautéed veggies (mushrooms, onions and peppers) and vegan cheese (I like the Daiya brand because it melts well). 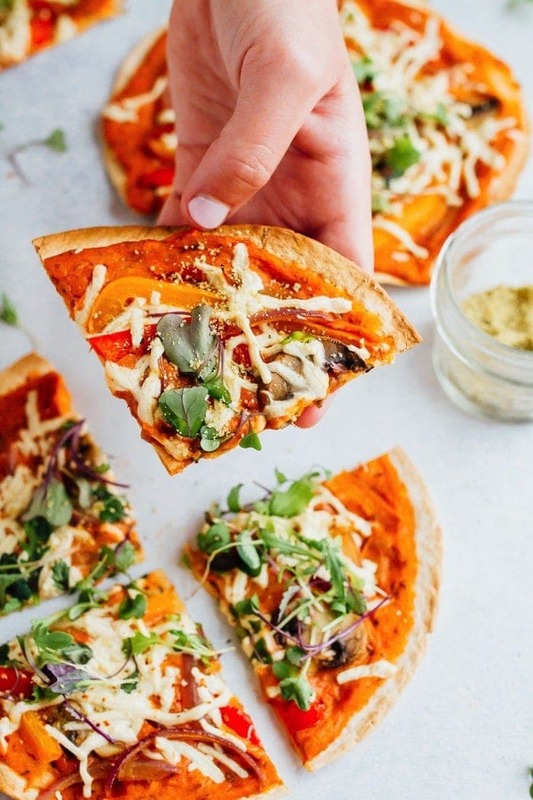 The most important thing to note about making these pizzas is that you’ll want to cook your veggie toppings ahead of time for two reasons 1. You’re only baking the tortilla pizzas for 10-12 minutes (just enough to get the tortillas crispy and melt the cheese) which isn’t enough time for the veggies to cook 2. Most of the liquid will evaporate while they’re sautéing so you won’t have to worry about the toppings releasing water and making the pizza mushy. After the pizzas were cooked, Maria and I added micro greens, fresh pineapple, hemp parmesan and crushed red pepper. All of which I highly recommend — the pineapple seriously took these pizzas to the next level. 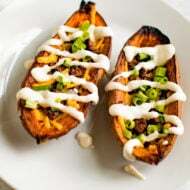 The sweet and savory combo is perfection! 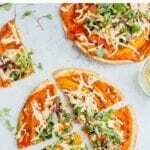 If you make these Tortilla Pizzas with Hummus please be sure to leave a comment and star rating below letting me know how the recipe turned out. 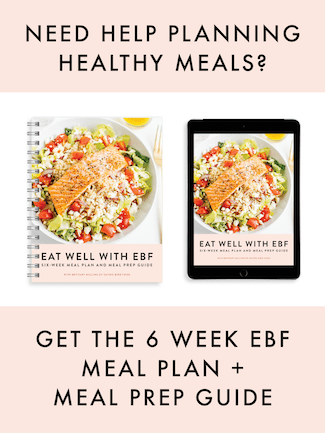 Your feedback is super helpful for the EBF team and other readers! Add 1/2 teaspoon of oil to a small skillet over medium-high heat. Once hot add veggies (bell pepper, onion and mushrooms) and sauté until just softened, about 5 minutes. Set aside. Mix all ingredients for pizza sauce (hummus, tomato sauce, onion powder, basil and oregano) together in a small bowl. Spread sauce onto four tortillas — using about a quarter of it on each. Top tortillas with cooked veggies and shredded cheese. Bake tortilla pizzas in a cast-iron skillet, on a pizza stone or directly on the oven rack (with a cookie sheet below to catch any melted cheese drips) for 10-12 minutes or until the tortillas are have browned and the cheese has melted. Watch carefully near the end so that the tortillas don’t burn. 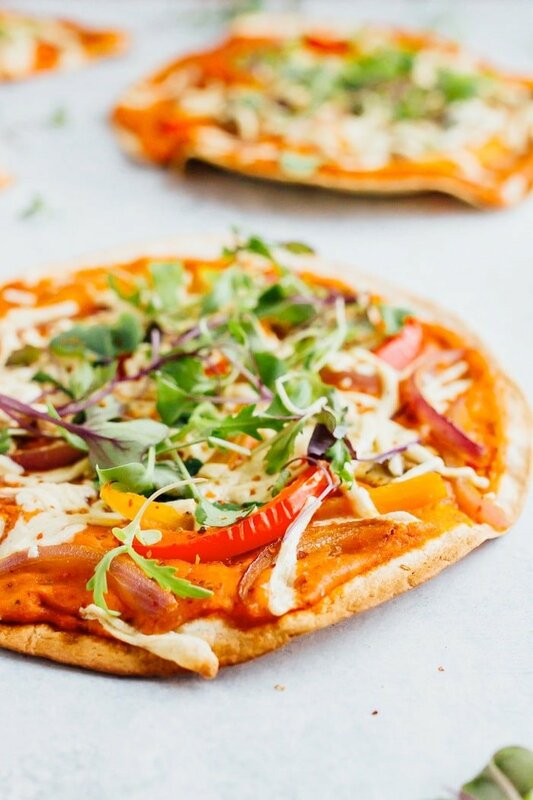 Sprinkle microgreens/arugula over each pizza and let cool before slicing. Sprinkle on red pepper flakes and hemp parmesan before serving. 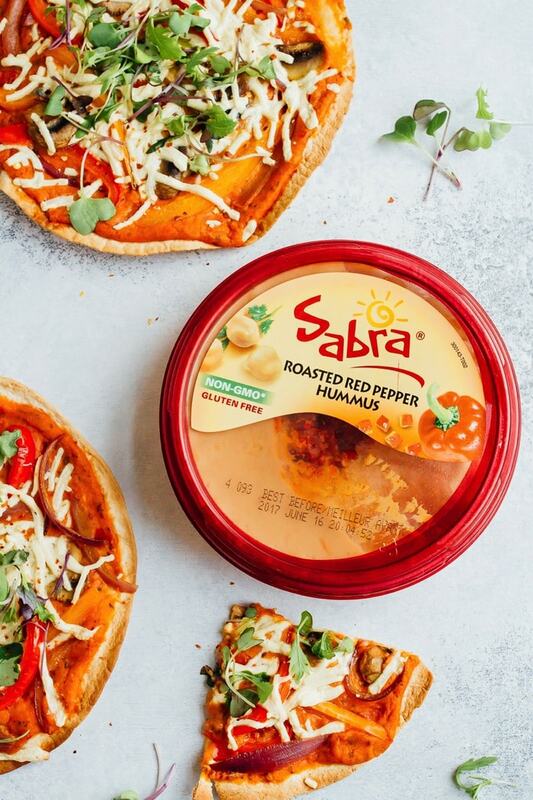 This post is sponsored by Sabra Dipping Co., but as always opinions are my own. Thank you for supporting the sponsors that make EBF possible. These look so good! And I was actually just looking in the fridge, wondering what to do with the pitas I have!! I’m so restricted in my hummus use! I need to branch out to more than just putting it in wraps or dipping carrots into it. This looks like a great first start! Yum. I love the idea of mixing up a normal pizza!! Thanks Izzy! I hope you get a chance to try it. This looks delicious. I am with you on the thin crust, I love a thin, crispy pizza crust! Thanks for sharing. 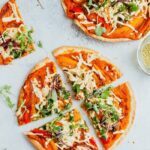 I love tortilla pizzas, and these look delicious and easy! Mmm! They really are, Andrew! I hope you get a chance to try them. Love this! I make a very similar pizza with flat out! What a cool idea! Definitely will have to try this recipe. Thanks for sharing! Oh my gosh…this looks soo yummy! Always needing to use up hummus when I run out of veggies. AND I LOVEEEE making naan pizzas! !